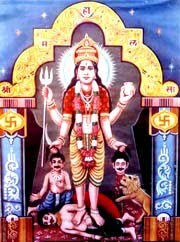 Mahalasa Narayani is a manifestation of Goddess Shakti. Some people believe that she is a manifestation of the Mohini Avatar of Hindu God Vishnu. Goddess Mahalasa Narayani is worshipped mainly in Goa, parts of Gujarat, Maharashtra and Karnataka. The most important temple dedicated to the Goddess is located at Mardol (Vernem) in Goa. Legends and the information on the manifestation of Mahalasa Narayani are mentioned in the Skanda Purana. Legend has it that the Goddess Mahalasa Narayani appeared on earth to annihilate a demon named Chandasur, who had created havoc in the region. It is said that Parashuram, the fifth incarnation of Vishnu, asked people to offer prayers to the Goddess so that she will annihilate the demon. In this form she is an incarnation of Goddess Shakti. The Brahmanda Purana mentions that Goddess Mahalasa Narayani is a manifestation of Mohini Avatar of Vishnu. This legend connects Mahalasa Narayani with the Malhari Martand Bhairav incarnation of Shiva. It is said that Mahalasa appeared on earth to marry the Martand Bhairav incarnation of Shiva. Therefore there are two versions of the incarnation of Mahalasa. But when she is mentioned as Mahalasa Narayani – the Goddess associates more with the Mohini Avatar of Lord Vishnu. But when the Goddess is just mentioned as Mahalasa, she is more associated with the Shakti cult. Mahalasa Narayani is depicted with four hands. In one hand she holds a Trishul and in another hand the head of a demon. She is that incarnation of Mother Goddess who protects her devotees from Adharma. She also reinstates Dharma.